In California, and in other regions dependent on hydropower, electricity prices tend to rise during droughts, when runoff, and thus power production, is constrained and electricity demands are high. Additionally, electricity prices in California are projected to rise by nearly 27% between 2008 and 2020 (in inflation-adjusted dollars) to maintain and replace aging transmission and distribution infrastructure, install advanced metering infrastructure, comply with once-through cooling regulations, meet new demand growth , and increase renewable energy production. While rising electricity prices will affect the price of all water sources, they will have a greater impact on those that are the most energy intensive, like desalination. The high energy requirements of seawater desalination also raise concerns about greenhouse gas emissions. In 2006, California lawmakers passed the Global Warming Solutions Act, or Assembly Bill 32, which requires the state to reduce greenhouse gas emissions to 1990 levels by 2020. Thus, the state has committed itself to a program of steadily reducing its greenhouse gas emissions in both the short- and long-term, which includes cutting current emissions and preventing future emissions associated with growth. Desalination ­­– through increased energy use – can cause an increase in greenhouse gas emissions, further contributing to the root cause of climate change and running counter to the state’s greenhouse gas reduction goals. There are several ways to reduce the greenhouse gas emissions associated with desalination plants, including (1) reducing the total energy requirements of the plant; (2) powering the desalination plant with renewable energy; and (3) purchasing carbon offsets. The Key Issues for Seawater Desalination series is an update to the 2006 Pacific Institute report Desalination with a Grain of Salt, which has proven to be an important tool used by policy makers, regulatory agencies, local communities, and environmental groups to raise and address problems with specific proposals, downloaded nearly 700,000 times. Researchers conducted some 25 one-on-one interviews with industry experts, environmental and community groups, and staff of water agencies and regulatory agencies to identify some of the key outstanding issues for seawater desalination projects in California. 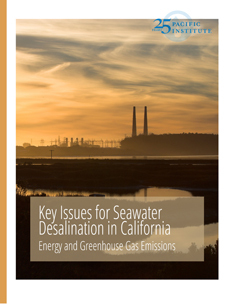 The resulting reports address proposed desalination plants in California, costs and financing, and energy and greenhouse gas emissions, with a forthcoming report on marine life and coastal ecosystem impacts. Go to the press release.